I think my love of the west and cowboys grew out of my love for my grandparents’ Iowa farm. I loved that place. I did a lot of thinking and dreaming there. I also learned a lot, mainly from my grandmother. The older I get the more I appreciate what I learned from her. She was an incredibly strong woman, but she possessed a quiet strength. She worked the farm and raised six children. I always thought her the most patient person I knew. She never had a cross word for anyone, and I can count on one hand the number of times she lost her temper. My grandmother always made time for me and my endless questions. Such a simple gift, her time and attention, and yet, such an important one. And I had a lot of questions about whatever she was doing, whether it be gardening, crocheting, sewing or cooking. All of which I still enjoy doing today. One day when she was making one of my two favorite treats, cream puffs–the other was her angle food cake with fresh strawberries–I asked questions and wrote down what she told me. Because of my curiosity, I have my grandmother’s recipe for cream puffs. For a holiday gift, I’m sharing her recipe with you. In a heavy saucepan, bring 1 C milk to a boil. Stir in above mixture. Reduce heat and cook until thick. When cool combine with ½ pint whipped heavy cream. Leave a comment about your favorite holiday treat and be entered to win a cup and plate set along with a copy of Family Ties. May 2019 be filled with many wonders and joys for you and your family, and remember, of all the gifts you can give, the best is your time and attention. Warning! A Tomato Can Kill You! Ha! Did I get your attention? This time of year when tomatoes abound in our gardens, and many of us are canning, freezing and eating the vegetable (or is it a fruit?) in any way, shape or form we can think of, it seems impossible to believe that at one time, tomatoes were very much feared. Tomatoes have been traced clear back to 700 AD, which is amazing in itself. By the 16th century, European adventurers here in the Americas discovered them and brought them home. At that time, the rich were served their food on pewter dishware. Unbeknownst to them, when high-acid foods like tomatoes were served on the pewter, the lead leeched out into the food, which resulted in lead poisoning and death. The poor, however, used wooden plates and thus did not have the lead poisoning problem. N otably, many Italians were poor and thrived on the tomatoes. Wasn’t long before they developed some pretty darn delicious dishes with those tomatoes, and we all know what those are–pizza and spaghetti sauce are only the beginning. Every year I plant tomatoes. Usually one plant, sometimes two. This year is my first for Romas, and my lone plant is a workhorse! It’s so prolific, I can hardly keep up with its bounty. Can you see how it’s spilling out of its cage? It can’t be contained. Enough already! I’ve preserved three batches of spaghetti sauce, two of salsa, one of plain tomatoes, and that doesn’t include all the tomatoes I’ve used in dinner dishes or eaten plain by the bowlful. Ah, well. Won’t be long, I’ll pull the darn thing up. Nights are getting shorter and cooler, which means the tomatoes are slowing down. In the midst of winter, I’ll certainly miss walking out to the garden for a fresh tomato right off the vine. In a 6 quart slow cooker on high, saute onion, garlic, green pepper and vegetable oil until onion is transparent. Add chopped tomatoes, oregano, basil, parsley, sugar, salt and pepper. Cook for 2 to 3 hours on low heat. Stir frequently. Let sauce cool. Pour sauce into quart size freezer containers. Store in freezer. When ready to use sauce, stir in can of tomato paste. Notes: I start sauteing first while I’m peeling the tomatoes. Also, I use an immersion blender to smooth the sauce a bit. Do you plant tomatoes, too? What’s your favorite way to cook with them? If you have a recipe to share, please do! While working with my grandsons on a Boy Scout survival project, I came across an interesting book by the Department of the Army, ”The Complete Guide to Edible Wild Plants”. It got me thinking about how our frontier travelers used some of vegetables, plants for spices, and medicinal purposes. This book answered many of my questions. Very important, please read this before you continue with the blog. Warning: The critical factor in using plants for food is to avoid accidental poisoning. Eat only those plants you can positively identify, and you know are safe. Plants are valuable sources of food because they are widely available, easily procured; and, in the proper combinations, can meet all your nutritional needs. Absolutely identify plants before using them as food. Poison hemlock has killed people who mistook it for its relatives, wild carrots and wild parsnips. Chicory: I think one of the most popular plants used throughout history is Chicory. The base leaves resemble those of the dandelion. The flowers are sky blue and stay open only on sunny days. Chicory has a milky juice. It can be found in old fields, along roads and weedy lots. All parts are edible. Eat the young leaves as salad or boil to eat as a vegetable. Cook the roots as a vegetable. I wasn’t aware that the plant are edible and had so many usages, but of course, coming from the South, Chicory used as a coffee substitute is well known. Roast the roots until they are dark brown and then pulverize them. I just image the frontiersman kept a look out for this plant. Dandelion: Believe it or not all parts are edible. I’m not gonna describe this plant, as we all have to deal with it during the spring and summer. The roots are high in vitamins A and C, as well as calcium. Like Chicory, you can roast and ground the roots for a good coffee substitute. Another use is the white juice in the flower stems can be used as glue. Sassafras: Everybody has heard of Sassafras tea in historical stories. This shrub bears different leaves on the same plant. The spring flowers are yellow and small, while the fruit is dark blue. The plant parts have a characteristic root beer smell. The young twigs and leaves are edible fresh or dried. Small dried young twigs and leaves can be used in soups. Now for the tea…dig the underground portion, peel off the bark, and let it dry. Then boil in water for tea. Of interest, shred the tinder twigs for use as a toothbrush. Now we know how the frontiersman cleaned their teeth! Here’s a couple of popular, yet dangerous, common flower garden plants. Trumpet Vine or Trumpet Creeper: The last two very dangerous plants I want to tell you about are ones that almost everybody have around them. The first is the Trumpet Vine, which climb all over fences and are intentionally planted. The trumpet-shaped flowers are orange to scarlet and climb to 15 meters high and spreads like a wild weed It has pea like fruit capsules. The caution on this plant is that it causes contact dermatitis, so be very careful working around this plant. If pruning, I’d make sure I had long sleeves and gloves on. And, I’d suggest you be very careful touching your face and be sure to wash your hands very good. Lantana Plant The second is a very popular plant. The Lantana is a shrub like plant that may grow up to 45 centimeters high. The color varies from white, yellow, orange, pink or red. It has a dark blue or black, berry like fruit. A distinctive feature is its strong scent. The caution on this particular plant, again very popular, is that it is poisonous if eaten and an be fatal. It also causes dermatitis in some individuals, so if you’re working with this plant, I’d follow my suggests for the trumpet plant. Again, I’m going to warn our readers that all or part of many wild plants, once used, can be very dangerous. Always, always be very careful about eating or cooking any wild plant unless you know for certain it’s safe. Cautious is best! When in doubt, don’t eat! Now my question to you, really two of them: Do you think the frontiersman used the edible part of wild plants? The second, do you think people died coming west due to consuming or coming into contact with dangerous wild plants? To one lucky winner who leaves a comment, I am giving away an eBook of my newest western contemporary romance “Out of a Texas Night”. I enjoy experimenting with tea flavors – green, black rooibos, herbal, chais. Some of my favorites are Hartney’s Hot Spicy Cinnamon and Bigelow’s Vanilla Chai. I also have a small collection of tea cups that I’ve collected – I’ve sprinkled images of some of them throughout this post. Not only is tea delicious but it is actually good for you. One of the things contained in tea are polyphenols which are antioxidants that repair cells. Because of this, consuming tea might help our bodies fend off cardiovascular diseases, cancers, osteoporosis, diabetes mellitus and other maladies. It is estimated that there a 1,500 different types of tea. Approximately 85% of tea consumed in the United States is in the form of iced tea. The United States imports over 519 million pounds of tea annually. Tea is second only to water as the most widely consumed beverage worldwide. The annual worldwide production of tea comes in at over 3 million tons. Tieguanyin, an oolong tea, is the most expensive tea in the world at a cost of about $1,500 a pound. The United States invented both the tea bag and iced tea. Not everyone thinks the tea bag is a good thing as connoisseurs consider tea brewed from loose leaves to be richer in flavor. A cup of brewed tea on average contains less than half the caffeine of the same amount of coffee. The Twining family opened their teashop, the Golden Lyon, in 1717. That shop is still open today. If a scene calls for an actor to drink whisky, they usually substitute watered-down tea, which has the same look as whisky. The action of tea leaves uncurling as hot water is poured over them is called “the agony of the leaves”. Loose tea stays good for about two years if you keep it away from moisture and light. Tea bags, however, are only good for about six months before they begin losing their flavor. Black, oolong, green, and white tea all come from the same plant, Camellia sinensis. The difference comes in how the leaves are treated after they are harvested. For black tea, the leaves are left to ferment until they turn black, then dried and packaged. Oolong tea follows a similar process to black tea, but each individual stage in the process is not as long. Green tea isn’t put through a fermentation process, rather it is either steamed or pan fried. White tea is the least processed of the four. It is made from younger leaves that are usually only left to sun dry briefly before being prepared for packaging. Herbal “teas” are technically not teas at all, but rather, something called a tisane. Largest Tea Bag – 551 pounds, 9.8 feet wide by 13 feet high. So, are you a tea drinker? Do you have a favorite flavor? And did any of the above bits of trivia surprise you? I’m a coffee drinker, as were many of the folks who settled the west. Pioneers, cowboys, ranchers, farmers, miners and townsfolk all loved coffee, but the process of making it wasn’t as simple as it is today. Green beans were roasted in a skillet over a fire, then put into a cloth bag and crushed with a heavy object. The grounds were dropped into a pot of water and boiled. The roasting beans had to be tended to carefully, because if one bean burnt, the flavor of it ruined the entire batch. Home roasted coffee could be quite foul if the roasting process went amiss. Before the Civil War, real coffee was expensive, so many people drank mock coffee made of rye, okra seeds, parched corn or bran. (Parched corn is dried corn roasted over a fire.) In the mid-1860s, Jabez Burns developed a commercial coffee roaster about the same time that affordable paper bags became available. A man named John Arbuckle developed a special glazing process using egg and sugar to preserve the flavor of the beans, and then bought the rights to a patented packaging system and began selling roasted coffee beans in one-pound paper bags. By 1881, his company was operating 85 coffee roasters. His coffee was billed as the “coffee that won the west”. Now back to cowboy coffee. While on the trail, cowboys had to stay alert during bad weather and hard times and coffee helped them do that. It also kept their insides warm and helped wash down meals. 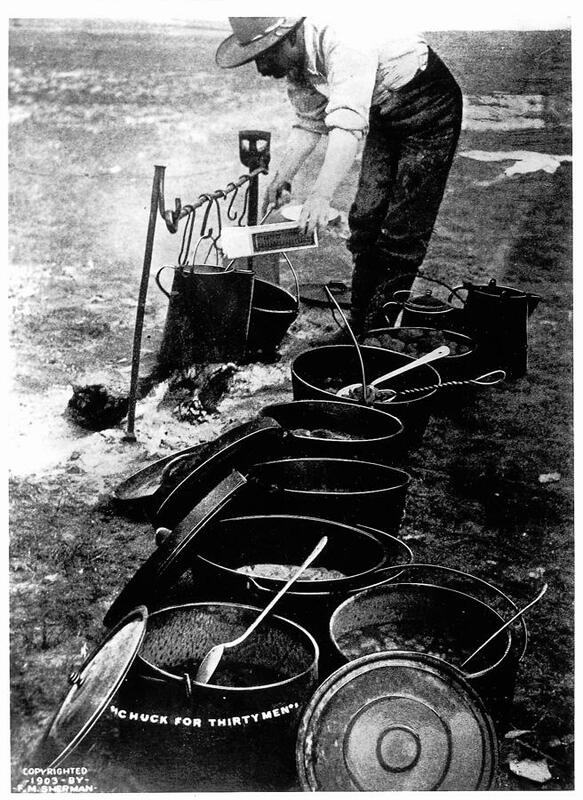 A camp cook usually kept several pots of coffee going at once, and it wasn’t uncommon to leave the old grounds in the pot and simply add new. One camp cook wrote that he used about 175 pounds of beans a month. 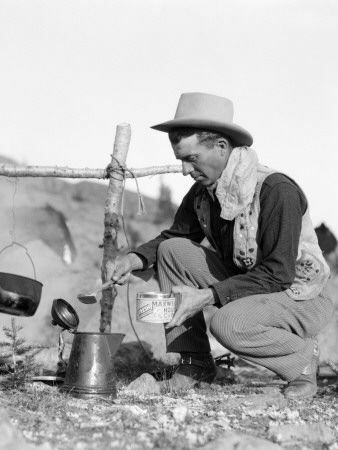 There are several ways to make cowboy coffee, but they all involve putting the grounds directly into the water. Some people advocate bringing the water to a boil, then throwing the grounds in (a 1 to 8 ratio — 1/8 cup coffee per cup of water). Others (including me) put the grounds in the water and bring the coffee to a full boil. Regardless of when you add the coffee, the next step in to settle the grounds. To do that, you either pour cold water through the spout, or add crushed eggshells. (I’m a water gal.) If this is done correctly, there should be very few grounds in your cup when you finish drinking. A while back I did a bit of research to see if it was possible for my 1892 heroine to serve a hamburger at her restaurant. When I discovered that May, among other things, is National Hamburger Month (I love my National Observances Calendar!) I thought this would be the perfect time to share some of the history and trivia I discovered during my research. First off, there have been meat patties, in various forms, for thousands of years. But to get to the origin of what we now think of as the all-American hamburger is more difficult than you might think. During my research I came across a number of different claims for how that wonderful sandwich came about. One of the earliest claims goes to Canton, Ohio natives Frank and Charles Menches. They were food vendors at the 1885 Erie County Fair. According to the story, when the Menches ran out of their usual fare of pork sausage, out of desperation they substituted ground beef seasoned with coffee and brown sugar as well as other seasonings. The new fare proved to be a hit and they dubbed it the hamburger after the fair’s location in Hamburg, Ohio. Another claim states the inventor was Fletcher Davis of Athens, Texas. It is said he first put a cooked ground beef patty between slices of bread in the late 1880s to accommodate customers who wanted something hearty but portable. According to locals, his claim is well documented. As the story goes, he eventually took his offering to the 1904 St. Louis World’s Fair where it was a big hit. Yet another theory proposes that it was the creation of a German cook by the name of Otto Kuasw out of Hamburg, Germany. He created a popular sandwich for sailors that was comprised of a beef patty fried in butter, topped with a fried egg, and served between two buns. The story goes that the sailors who travelled between Hamburg and New York, would request a Hamburg style beef sandwich when dining in American restaurants. Those claims, however, are disputed by proponents of Louis Lassen of New Haven, Connecticut. Their story is that Lassen created the burger in 1900. The descendants of Lassen consider it a matter of family pride, and they have the Library of Congress backing up their claim. There are many other very passionate claims about the hamburger’s origins, and to tell the truth, it was likely invented independently across the country by quite a number of individuals. One thing is true – several food vendors sold them during the 1904 St. Louis World’s Fair and from there it quickly spread across the country. During World War I, because of the food’s tie to the German city of Hamburg, the U.S. Government tried to change its name to the more patriotic-sounding Liberty Sandwiches. White Castle, founded in Wichita, Kansas in 1921, holds the record for being the oldest hamburger chain. Their first burger sold for a nickel. According to an AP report, in 2003 PETA (an animal rights group) offered officials of Hamburg , NY, $15,000 to change the name of their town to Veggieburg. They declined. In 2012, cooks at the Black Bear Casino Resort in Carlton, Minnesota prepared what was then the largest burger on record. It weighed in at just over a ton and then was topped with 52.5 pounds of tomatoes, 50 pounds of lettuce, 19 pounds of pickles, 60 pounds of onions, 40 pounds of cheese and 16.5 pounds of bacon. In July of 2017 that record was broken when 6 men in Pilsting Germany created a burger that weighed in at a little over 2,566 pounds. 50 BILLION burgers are consumed in the United States each year. If that quantity was laid end to end, they would circle the earth over 32 times! The average American eats a hamburger 3 times a week. Of all sandwiches sold globally, 60% are hamburgers. McDonald’s sells 75+ burgers every SECOND. As for me, my favorite burger is one that is grilled to medium well, topped with pepperjack cheese, bacon and bbq sauce and serve on a toasted sesame seed bun. So tell me, did any of the above facts surprise you? And do you have a favorite way to have your burger prepared? I hate to be the bearer of bad news, but I think you should know that the classic candy that has been a constant since 1847, is about to go the way of phone booths. Yes, that’s right. The company that makes Necco Wafers has announced that, unless it finds a buyer, it will close its doors forever in May. Do you know what that means? Future generations will never know what drywall tastes like. Originally called hub wafers, the coin-shaped candies were carried by soldiers during the Civil War and World War II. Since the candy traveled well and never melted or spoiled, soldiers and yes, even cowboys, could carry them with confidence. These candies traveled as far as the North Pole, and that’s not all. Admiral Byrd took two tons of the things with him to the Antarctica. Even more impressive; Necco Wafers was the first candy to multi-task. They served as wafers during communion and were tossed in baskets for payment at toll booths. Sad to say, Necco isn’t the only old company at risk. In recent years, we’ve seen the demise of the Sears Wish book and five and dime stores. Who knows what will be next? I don’t mean to be an alarmist, but I shudder to think that Baker’s chocolate—a friend to cooks since 1780—might someday be declared unfit for human consumption. Don’t laugh. It happened to wheat, eggs and red meat. Who’s to say the same thing won’t happen to chocolate? Never mind that cowboys and civil war soldiers enjoyed morning cups of Baker’s hot chocolate with no known problems. Cast-iron stomachs of the past have no place in today’s world. It’s not just food and drink that’s in danger. The next company that could bite the dust could very well be Remington, established in 1818. It’s hard to believe that the company that produced the “rifle that won the west” might one day close its doors. But firearms aren’t all that popular these days. Nor for that matter are typewriters. So who knows? And what about Brooks Brothers, another formidable company founded in 1818? The company made the first ready-to-wear suits in 1849. Those flocking to California that year for the gold rush couldn’t wait for tailors to outfit them. For that reason, forty-niners depended on Brooks Brothers for their clothing needs. So did Abe Lincoln, Eisenhower and J.F. Kennedy. Anything made of paper is about to become obsolete, including maps, shopping bags and checks. Here in California, the war on drinking straws is heating up. If that’s not enough, many of the nation’s newspapers have vanished in recent years. That means that old standbys like The New York Times (founded in 1851 as the New York Daily Times) could one day shut down their presses forever. I also worry about Merriam-Webster, founded in 1831. If it goes the way of encyclopedia salesmen, I will have to share the blame. I can’t remember the last time I actually looked something up in an honest-to-goodness, print dictionary, can you? Nothing is safe in today’s fast-paced world as proven by Kodak. Who would have thought that a company that we all knew and loved would close its dark-room doors forever and stop making cameras? Founded in 1889, Kodak was the absolute leader in photography. It’s still in business making mobile devices, but its past glory is gone. Phone cameras have taken its place, but it’s not the same. An iPhone second just doesn’t have the same ring as a Kodak moment. So, what old-time product do you or would you miss? What were you glad to see go? It’s a scary world and about to become a lot scarier. Not only are we faced with the prospect of driverless cars and mirrors designed to voice unabashed opinions of our wardrobes, I recently realized that my “smart” doorbell has a higher IQ than I do. Cowboys and cowgirls of the future? Now scientists are closing in on giving us animal-free meat. What that means is that our steaks will soon be grown in labs, not on cattle ranches. Cowboys of the future will wear white coats instead of denims and Stetsons—and they sure won’t be riding horses. It’s not hard to understand what’s driving this new technology. Some believe that cattle and the methane gas they produce is the number one cause of global warming. There are also financial considerations; It’s estimated that the cells from a single live cow will produce 175 million quarter pounders! That’s about what McDonald’s sells in nine months. I’m currently working on a book set on a Texas cattle ranch in 1800s and I can’t help but wonder what my hero would think about all of this. No doubt he would be appalled and regard the so-called “clean meat” as a thr eat to his very existence. But he also knows what it’s like to fight a losing battle. In the book, his ever-ready Colt stops rustlers, horse thieves and “belled snakes,” but is useless in the face of progress. Only time will tell if the National Cattleman’s Association will be successful in convincing consumers to demand the “real thing” in their hamburgers. Or if it, too, will go the way of cattle drives. Of course, not everyone agrees on what the “real thing” is. Some aficionados insist that none other than grass-fed cattle fit the bill, but that can be a hard sell. Grass-fed cattle taste different than cattle fed on corn and soy. It has less fat, which means it’s healthier, but the taste doesn’t always suit modern palates and can take some getting used to. Then there’s the difference in texture. Grass-fed cattle move around more than cattle in feedlots and therefore have more muscle. This makes the meat “chewier.” Those rugged cowboys of yesteryear might have relished a chewy steak while sitting around a campfire, but today most people prefer the tender, melt-in-your mouth taste of prime grain-fed beef. Feed, muscle and fat aren’t the only things that affect taste. The way meat is handled during shipping, aging and preparation makes a difference, too. Barbecued steak doesn’t have the same flavor as meat cooked on an open campfire. So even if you purchase grass-fed beef today, it still won’t taste the same as it did during those old chuck-wagon days. Who knows? Maybe future generations will prefer the taste of lab-grown meat, which some describe as “crunchy.” There’s no stopping progress, but neither can we stop changing tastes. So what changes or new tech do you like or dislike?